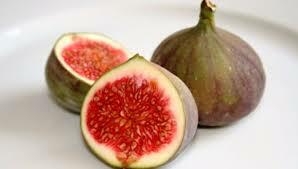 The fruits of a fig tree have exactly one day shelf life. The inside of the soft fruit is red or gold colored. The skin is very thin and vulnerable. They are at their best when they are picked directly from the tree. You can peel them and eat them rightaway. They can also be dried and used in different recipes. They are also used to make jam. We have a little recipe. Wash the figs and cut the stems and crowns off. Cut the figs into small pieces and place in a saucepan. Add the orange zest and juice with it, like sugar. Boil for 10 minutes and then put it away to cool off. Put on four plates a piece of cheese plus a spoonful of the fig mixture and sprinkle with chopped walnuts.